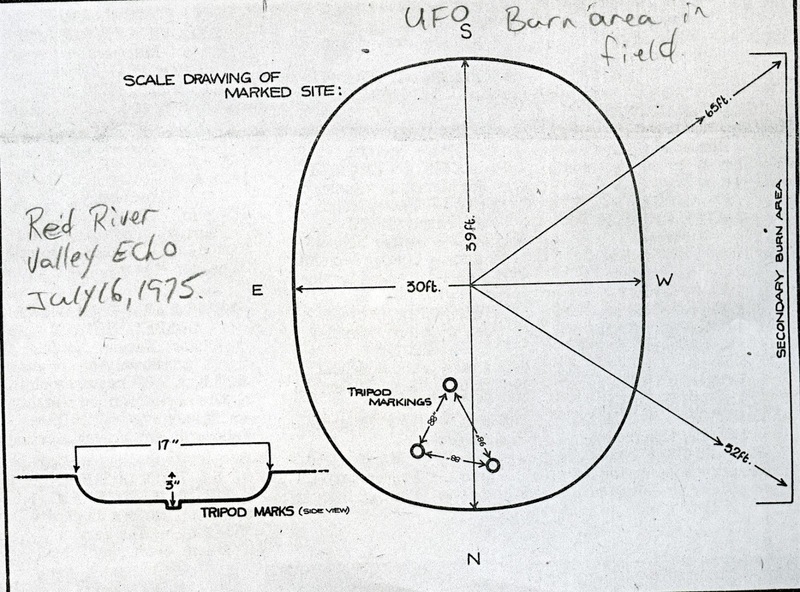 A lot of people have been asking me about the Charlie Redstar UFO flap of the 1970s in Manitoba. Was it really as spectacular as it's claimed? Well, yes and no. It started in 1975 just as I was starting to investigate UFO reports. I spent many, many hours in the Manitoba countryside and talking with witnesses of the many nocturnal lights that were seen. That's mostly what they were - simply lights in the sky. (There were a few notable exceptions, but they were few and far between.) And most cases had simple explanations. Some explanations were particularly interesting. For example, I learned from some farmers near the US border that sure enough, there were lights moving along the border and into Canada many evenings, but they were generally know to be ATF aircraft from North Dakota looking for drug smugglers. Most farmers knew that marijuana was grown on the Canadian side under railroad trestles and other secluded spots and then shipped to the USA after harvesting. Beyond these reports, however, dozens of witnesses came forward during the Carman flap. Sightings during the summers of 1975 and 1976 were so common that there were actual traffic jams on farm roads (more like dirt tracks) in the countryside, cause by cityfolk wanting to catch a glimpse of what all the fuss was about. I described this circus atmosphere in several pieces over the years. No less a ufology figurehead than Jacques Vallee himself introduced a film of Charlie Redstar in an episode of a TV show many years ago. A clip is still on Youtube here. It's been analyzed several times and the consensus is that some of what is on the film was caused by a camera malfunction. The moving light itself, however does seem to have been observed by the witnesses. Although the first few years of the 1970s had respectable numbers of UFO reports, they in no way matched the dozens recorded for the 1967 1969 flap. But five sightings were reported in February 1975, prophetic in their style and description. Early in the month, a farmer was walking to his barn north of Lundar, when a light that "looked like a ball" swooped down over his head. While gazing up at the object, he felt as if "hot plastic" had been poured on his face. He said it was "suffocating," and that he "couldn't think straight" while it was over him. The light was red and about 14 to 18 inches in diameter. This may have been the first sighting of what came to be known as "Charlie Redstar," the strange red light frequently seen bobbing over the hillsides in the area near Carman, 70 kilometres southwest of Winnipeg. Although the majority of sightings in the Carman wave were observations of distant lights in the night sky, a considerable number of cases involved the observation of classic "flying saucers." Several people reported seeing disc shaped objects at close range, near enough to see "portholes" on the sides or underside of the strange craft. There were reports of "Ferris wheels" in the sky, with a multitude or coloured lights moving in slow, ponderous action, very like the vehicles depicted in the movie Close Encounters of the Third Kind. However, the sightings at Carman predated the movie's special effects. When considering UFOs, some sightings obviously carry more weight than others. If more than one person sees a UFO, this is perhaps more reliable than a single witness incident. Also, if a photograph is taken, this sometimes is considered to support the observation of the witnesses. And, if there are physical traces left in the area, the case is similarly regarded in higher profile. The case which is generally taken to be the beginning of the Carman wave of "Charlie" sightings occurred on March 27, 1975, southeast of Graysville. A young girl was awakened by a loud "shrill, pulsating siren" at about 2:00 a.m., accompanied by the feeling "like an earthquake." She briefly saw a red ball of light pass her window on its way south, and thought it had set the house on fire because of the intense light flooding in the window. The object was thought to have flown over the house from the north, and was last seen on the southern horizon, "looking like the Sun was coming up." ... a big red light coming at us, like a big landing light. You couldn't miss it. It was right at eye level, and it was just loafing along. It was close enough already that you could see the dome on the top, but it was all red - pulsing red. The saucer shaped object flew towards them from the west, then eventually veered north and travelled "about 300 feet above the tree tops," going an estimated 30 miles an hour. The entire sighting lasted no more than five to seven minutes. The Diemerts observed objects a few more times that month, but the real affront on their airport took place later, beginning on the 7th of May, when sightings began a nightly streak that lasted, literally, for months. During the summer, a large number of people would gather at the Diemerts' field, watching for the nightly appearance of Charlie Redstar as he (or it) skimmed low over the trees on the horizon, then soared overhead in a grand finale. ... I drove a mile north...then another mile west, where I stopped the car. Off to the northwest there was an oval shaped red light. There was an X-shaped. white halo around it, not connected to it. The light was somewhat the colour of a traffic safety light - a stop light. ... I sat there for two or three minutes just looking at the object, which appeared stationary at the time. Then I decided to get a closer look at it. I drove west...and I can say I was moving pretty fast. As I was going west, the object seemed to be flying in a northeasterly direction. ... I continued for approximately 12 miles, keeping the object in sight, trying to get somewhat abreast of it so that if the opportunity presented itself, I could have driven north toward it. ... About 16 miles west of Carman, I stopped the car. I'd seen there was no way I was going to catch up to it. So I just stopped the car and watched the object go out of sight over the tree line on the horizon. There was one case during the Carman flap that involved multiple witnesses, observations simultaneously from different directions, television news footage and physical traces in the form of "radioactive" soil. Because there were so many people involved, and the events took place over a large area over a few hours, the reconstruction of the incident was quite difficult, and further complicated by conflicting accounts and statements by the witnesses. Regardless of which version is the most accurate, there is no doubt that something very strange happened on the night of May 13 14, 1975, a few miles northwest of Carman. Because "Charlie Redstar" was being reported so often, Bob Diemert contacted CKY TV in the hope that filming the UFO would prove what was being reported. He told CKY TV that if they sent a TV news crew to Carman, they would film Charlie for sure. Bill Kendricks, John Berry and two others went to Carman on behalf of CKY, on May 11, 1975, and saw nothing of interest. They went out again on May 12, and saw only a LATER (Light At The End of the Road), a "boring" kind of UFO which is self- explanatory. John Berry got in his car and tried to approach the light, but as is typical of this kind of UFO, it moved away and disappeared ("blinked out"). The cameraman who was out with them then went back to Winnipeg and immediately filed for overtime pay, annoyed that he had been on a wild goose chase. The next morning, when the news director received the request for overtime, he was upset at the extravagance that resulted in no worthwhile footage. He then forbade all cameramen from going to film any UFOs, unless they went on their own time. On May 13, Bill Kendricks and Allen Kerr (a film lab technician) took a TV camera to Carman and met with others to wait for Charlie to appear. About 11:30 pm they saw a light on the western horizon. The object rose above the trees, drifted slowly south, then briefly flashed a brilliant light and shot "straight up at incredible speed." This swift departure went so fast that only two of the many gathered saw it. ... I could see this big glow behind some trees less than half a mile away off to the right and ahead of us ... It was smoky red, a hazy glow, and to me the thing was higher than the trees, maybe 50 feet tall. It was about 20 feet thick and was sitting at an angle of about 45 degrees. The edges were fuzzy and not sharply defined. It was much like seeing a drive in movie screen from the side. Several days later, Bennett led investigators to the area where he believed the object had rested. They took readings with a radiation survey meter, but the energy was at the normal negligible background level. At the "landing site," they discovered "a series of hot spots about 85 yards apart, each with a radius of approximately 25 feet." The readings from these areas were not that much greater than the normal background level, and could have been due to equipment malfunction. Radiation anomalies have sometimes been claimed by investigators of UFO landing sites, though this is disputed by skeptics. Group 2 consisted of Bob and Elaine Diemert and Mr. and Mrs. Bill Kendricks. They travelled south one mile and then went west to approach from the opposite side to Group 1. The object seemed to them to be "rising and falling like a blood red Moon through the trees." The group tried to close in on the object, but it suddenly "popped into the air, hovered...and then took off straight for the CBC tower [east]." Group 3 included Allen Kerr, the cameraman, who caught the object on film as it "jumped into the sky." His group was at the CBC tower, and he panned his camera with the object as it approached and flew overhead. Kerr claims he panned in a vertical angle from about 45 to 90 degrees, held the camera steady for a few seconds, then followed it again to about 135 degrees. The result was three and a half seconds of film showing the ground light observed earlier, then the few seconds of the stationary view when the camera was held at 90 degrees. The first sequence shows the object on the ground and increasing slightly in size, then "jumping" up to the top of the frame after a flash of light illuminates the horizon. This "flash frame" was considered by one cameraman to be a defect for this particular type of camera. This idea was rejected by most of the individuals involved with the sighting, although they themselves had not seen any such flash of light at the time. The second sequence shows a red, pulsing light following a wave like motion in its flight across the frames. There also seems to be a series of "echoes" following the object on the film. The film was examined by many people, including myself, as well as Dr. J. Allen Hynek of the Center for UFO Studies. Hynek was put on the spot when he visited Winnipeg by CKY when he was asked on camera what he thought of the film sequence. He replied, quite diplomatically, that it was "the best film of a nocturnal light I've ever seen." Even now, there still is little else to say about the film; it is a short sequence showing a small red light moving in the sky. But what was seen? Three groups of witnesses saw the same thing from different locations at the same time; a strange light moved from the horizon then zoomed overhead. An aircraft? But Bob Diemert knew what airplanes look like at night, and it definitely wasn't one of those in his opinion, and in the opinion of the several others present. In any case, why only a red light? An aircraft should have displayed other colours if it had been seen under similar conditions, and it would have made some noise, which "Charlie" did not. Maybe it is premature to suggest than an alien spacecraft flew over the groups that night, but something very odd was seen and photographed. The sightings of Charlie Redstar went on all that summer, and soon UFO watching became a favourite pastime for Carman area residents. Carloads of curious people came each night to see their own UFO zipping through the night sky. The media were having a heyday, both in print and on the airwaves. Ads in local newspapers urged the reader to "Shop where Charlie Redstar shops!" Carman residents even received a visit from a National Enquirer reporter, getting the tabloid's "scoop" on the situation. A circus like atmosphere evolved; cars lined the dirt roads along favourite hot spots, and traffic jams occurred when Charlie flew by and drivers scrambled to be first in the chase. During these chases, speeds of 80 or 90 miles per hour were not uncommon, and it was perhaps only luck that no serious accidents happened. UFO watching parties took place throughout the region, lasting in many cases through the night and into the dawn. It is no wonder, then, that literally hundreds of sightings of Charlie Redstar and his friends were made during that summer. There were a number of remarkable reported UFO sightings that came out of this flap, and a discussion of the Carman wave would be incomplete if it did not include at least some of them, to give the reader a better picture of the magnitude and scope of the incredible phenomenon. For example, the Stephenfield case of May 16, 1975, shows another element of the Carman flap. Three young men had been at a large beach party on the north shore of the Boyne River Lake, and admitted to "having a few." The three had wandered away from the party, and had ended up on the south side of the lake near a dock, when one of them pointed out a bright, moon sized red light which was stationary about 500 to 1000 feet above the dam at the eastern end of the lake. They watched it for ten minutes as it remained motionless. Then, suddenly, it shone a steady beam of opaque white light onto the lake, at a point directly between two buoys, and about 100 feet from the shore of the lake. This beam of light played upon the surface of the lake while a white, glowing object appeared under the water, just below the surface. Then, they claim, this UUO (Unidentified Underwater Object) began to move toward them in the direction of the dock. As it moved, ripples appeared on the surface of the water above it, as if it were vibrating. These could be seen easily, since the glow from the object was bright enough to light the bottom of the lake (about 15 feet). When the UUO had approached to within 20 feet of the dock, one of the three nervous observers picked up a large rock and threw it at the object. He apparently hit it, for it seemed to break up into four sections that then returned one by one ("like a conveyor belt") to the point of entry into the water. The light beam went out, the glow in the water disappeared, and the object over the dam broke into two separate halves that took off in different directions after performing various manoeuvres. This had taken place at about 2:00 a.m., and the three claim they were the only witnesses to this event. As bizarre as the story is, it is unlikely that all three imagined the same sighting at the same time, even if they were not especially sober. They were very hesitant to come forward with their story, and they had nothing to gain by its publicity. Their story was never published until now, and they still stick to their tale. Other sightings showed other characteristics of the UFOs, including some classic "flying saucer" shapes. There was a remarkable sighting in Winnipeg at the end of March that deserves some mention. While driving west on the Perimeter Highway one evening, a lone witness noticed a "glowing, solid white light" several miles away and slowly moving in the southwest. He watched it for some time, and eventually concluded that it looked different from other aircraft that were in the sky. As he watched, the object suddenly "made a sharp turn to the right and started heading towards Charleswood." But as it approached the highway (across its path), the light "went out." The witness stopped his car at the side of the road and from his car, he watched the object move silently across the road into a field. It manoeuvred for a while, then shot "straight up" and "disappeared in a few seconds." The object was football shaped, about 40 feet wide and 15 feet thick at the center. It was only 100 yards from the witness, 30 feet off the ground and "doing around 50 m.p.h.." No one else claimed to have seen this object, though it took place on the edge of a populated area! But in all fairness, the area in question is occupied only by farmland, so that the only other witnesses might have been other travellers (in fact, the person who made this report did say that several cars passed while he was stopped on the road, but they took no notice). ... about 85 feet in diameter and perfectly round so round it was unbelievable. It was saucer shaped...and the top and bottom travelled in different directions. The bottom one spun...to the right, and the top one spun to the left. ... There was a center section that didn't move, about six to eight feet in width, and there was oval shaped windows in it. I'd say that there was about 16 windows in the whole circumference, eight looking on the side we were on. The object appeared to land in a field nearby, but although the witnesses drove their four-wheel drive truck across the field in pursuit, the object took off before they reached it. Even in the winter, there were UFO sightings. On January 20, 1976, several local residents were driving from St. Claude to Haywood at about 9:45 p.m., when they saw a large light "spring up." The orange ball of light appeared to be in the middle of an inaccessible field of snowdrifts. Many other witnesses, including a busload of passengers on their way to Winnipeg, saw the strange light. Around the beginning of March 1976, Charlie returned to the skies over Carman. UFO watchers braved cold weather to catch a glimpse of the aerial acrobat again. One of the most dramatic encounters with "Little Charlie" (as the LATER version was called by the UFO hunters) occurred on April 3, when Grant Cameron and a friend went to a favourite UFO spotting location near the town of Sperling. Around 8:00 p.m., after moving to a location near a bridge, off to the right they saw an orange ball of light "at the same level as the bridge crossing ... the glow on the object was five feet across but how big the object itself was we could only guess. This is because the surrounding glow was extremely bright." They got out of their car and walked within about 100 feet of the strange glowing light at the side of the bridge. Suddenly, Cameron looked back towards their car, and saw that another orange object "was sitting right on top of the car." They both turned and ran back towards the car, but suddenly remembered the object on the bridge. However, they saw that it had disappeared. Then, again turning back to the direction of their car, they saw the second object "going down the road a ways, where he turned off his lights." When they finally did reach the car, they looked back to see the first object back at its original position near the bridge. Cameron admitted they were "quite shaken by the whole affair." He speculated later that the second object acted as a ruse to draw them away from reaching the first. There was no question in their minds that the lights were guided by some "intelligence." Treating Charlie as a physical entity was common to many watchers' descriptions. To this day, many local residents insist that Charlie was a real "living" thing that chose the years 1975 and 1976 to fly over their rooftops. This perception was reflected in many ways; there were songs and poems made up about the aerial antics of the lights, and one religious family published a tract attesting that they had a marvellous vision of the Endtime while watching the skies in the Carman area.